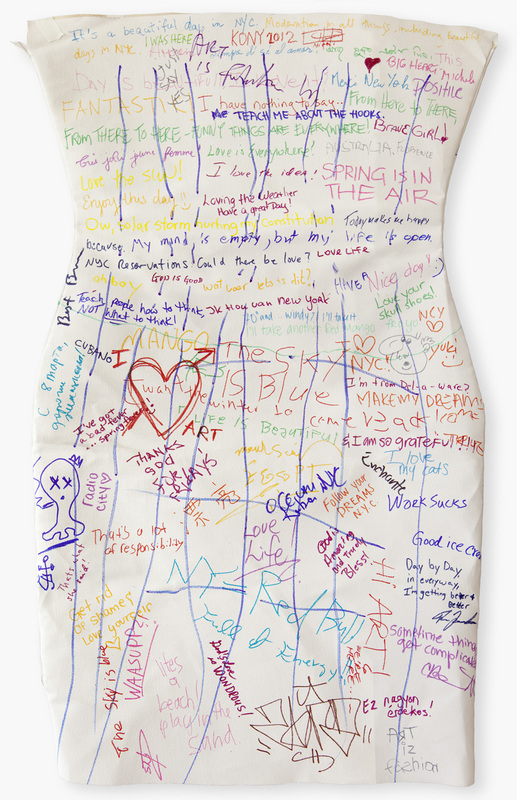 As part of Xquisite Corpse Act One I wore a white canvas dress on the streets of Manhattan and asked New Yorkers from all walks of life to write me a message. From the delivery guy on East 51st street, people waiting to be seated for lunch on the Upper East side, the doormen of Radio City hall, patrons waiting for their limousines at the Art Fairs, to the amazing person who literally dragged me inside the Armory Show, to visitors of Scope - New York, to a bar on 6th ave, to the cashier at Trader Joe's on 23rd street.. In 15 languages and almost 200 messages, we wrote the poem of our collective subconscious and I called it Today. Thus, the Xquisite Corpse Poem was written and Xquisite Corpse Act One was complete. I took the term Xquisite Corpse quite literally. With Corpse meaning “body”, as in physical structure, with the root of the word going back to Latin corpus “body". This work is about the body, the body as a landscape, and whatever surrounds the body, the reality that surrounds the body, also as a landscape. As the body swims through reality it makes wakes and it changes it in someway. Click to see the Xquisite Corpse Statement…..